Greek archaeologist Yiannis Lolos has unearthed the remains of the palace of King Ajax – the mighty hero in Homer’s Iliad who fought in the Trojan War to rescue (the Spartan) Queen Helen only to commit suicide later. Dr. Lolos found remains of the palace while hiking on the island of Salamis in 1999 and has led excavations there ever since. So far, his team has uncovered 33 rooms spread over 4 different levels. Salamis was also the site of a 480 BC Greek naval victory over the Persians which spelled the end of their invasion of Greece. The ancient playwright Euripides was born there, and a cave excavated by Lolos in 1997 has been identified as a hideout where the poet composed some of his work. Nan Madol consists of 92 man-made islets constructed from volcanic columns of basalt. It is located on Pohnpei in Micronesia. Some of the basalt columns are 30 feet long and weigh over 50 tons. Who would expect such huge stone structures to rise in the middle of nowhere? Radiocarbon dating suggests that human habitation began as early as 500 A.D. and the megalithic construction complex was completed about 1500. How were the huge, massively heavy columns of basalt quarried and how were they transported? Why was Nan Madol built at all? Why about 1400 AD did the inhabitants stop building their massive ocean-going canoes and go into an irreversible decline? Sometimes basalt occurs in nature as long prisms of hexagonal cross section. 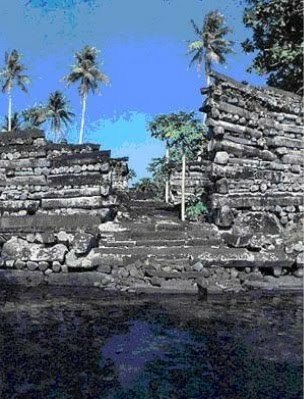 In Report #2 we discussed how ancient Micronesians quarried massively heavy columns of basalt to build their incredible megalithic complex of 92 artificial islets at Nan Madol. An even more fantastic discovery is that the inhabitants of ancient Mesopotamia artificially synthesized their own basalt. To achieve this, the ancient Mesopotamians had to build furnaces that could reach temperatures as high as 1,200 degrees centigrade that were much larger than those used for smelting metal. Then, starting with alluvial silt, they proceeded to melt it. (What made them think that silt could be melted to begin with is not known.) Afterwards they had to discover that very slow cooling over a period of 20 to 40 hours was needed to for the growth of large crystals from the melted slag. Scientists believe the artificial basalt was used in building construction and to make food grinding implementations. Over 40 years ago archaeologists discovered Neanderthal tools within a lignite open-mining pit in the foothills of the Harz Mountains. A sticky fingerprint on a fossilized hunk of wood led scientists to a startling conclusion: the ancient hunters synthesized their own glue which they subsequently used to affix stone heads to wooden handles in the construction of tools. Sophisticated gas chromatography and mass spectroscopy of the remnant pitch revealed that it was made from birch bark by burning it under very carefully controlled conditions. According to the scientists the smoldering process “must be carried out at the correct temperatures and under exclusion of oxygen ….” In order to obtain resin that can be used as glue. The fact that Neanderthals invented such a sophisticated process “proclaims the intellectual and technical abilities of the Neanderthals” according to one of the investigators. Neanderthals appeared approximately 230,000-300,000 years ago and are believed to have gone extinct about 30,000 years ago. The Incas, for all their sophistication, never developed a system of writing. Instead they apparently invented a seven-bit binary code to store information, more than 500 years before the invention of the computer, in the form of elaborate knotted strings known as khipu. Derived from the word for 'knot' in the Quechuan language of the Inca - still widely spoken in the Andes highlands - these decorative objects consist of one main cord to which are attached several pendant strings. The positioning and colors of the secondary and tertiary strings attached to the primary cord all have meaning. The knots along each string also convey messages. In this fashion khipu incorporate a sophisticated three-dimensional notation that no one has been able to unravel. 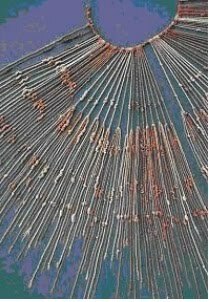 The conquistadors thought that the intricate colors and patterns of the khipu were the work of the devil and proceeded to destroy them. Today only about 700 khipu remain. With the aid of a sophisticated relational data base scientists are finally beginning to decipher the three dimensional coding system that the Incas invented centuries ago. This giant geoglyph stands almost 600 feet tall and can be seen from as far as12 miles out at sea. Etched into a sloping hill at Pisco Bay on the Peruvian coast, it somewhat resembles a candlestick; thus, its name "The Candelabra of the Andes." Pottery found near the figure has been carbon dated at 200 BC. No one knows why the mysterious geoglyph was constructed. ROCK ART: RECORDINGS OF ANCIENT COSMIC EVENTS? 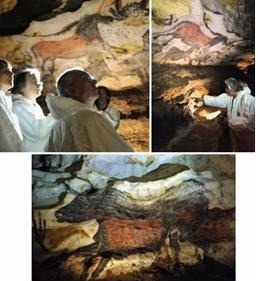 Cave paintings of early Paleolithic cultures, some dating back 32,000 years, were a poignant expression of ancient man’s attempt to create artistic impressions. 20,000 years later the transition to Neolithic art ushered in a radical change in which the attractive and colorful cave paintings were supplanted with geometric oriented petroglyphs sometimes accompanied with crude stick figures. Was there a loss of artistic talent and skills during the intervening millennia or did later cultures experience a global event(s) that they tried to communicate? Petroglyphs are found on every continent except Antarctica. For centuries their existence has baffled archeologists and anthropologists. The largest digital collection of petroglyphs and geoglyphs in the world, with millions of entries, is at Los Alamos National Laboratory, NM. In addition to the displayed rock art each entry includes latitude & longitude coordinates as well as the altitude of where the petroglyph was found. Whenever possible the age of the artwork is also recorded. The data are plotted on a digital image of Earth. Physicist Anthony Peratt has compared the geometric designs found on petroglyphs and geoglyphs to the types of radiation patterns associated with a type of plasma discharge called high-current Z-pinches. He has found that a great many archaic petroglyph designs correspond to various patterns associated with different types of plasma instability. Since these petroglyph morphologies are found world-wide, he suggests the occurrence of an intense aurora(s) many thousands of years ago resulting from an increase in the solar wind between one and two orders of magnitude. Ancient cultures around the world diligently recorded the patterns of spectacular light displays that decorated the heavens. Report # 9 in the topic series Planetary Sciences and Earth Mysteries describes a concentric spiral petroglyph designed by the Anasazis which they used as a unique, advanced and very unusual solar calendar. Scientists at the Georgia Institute of Technology have solved a baffling mystery as old as ancient Greece: the spectacular acoustics of the Theater of Epidaurus, built in 400 BC, on the Peleponnese in Greece (featured in the above photo). It turns out that audiences in the back row can hear stage performers with amazing clarity – although for centuries no one knew why. Speculation fell on the wind which blows primarily from the stage to the audience. Others opined that the slope of the rows of seats was a contributing factor. The breakthrough came when scientists discovered that the limestone seats themselves act as an efficient acoustical filter that dampens low frequency background noises like the murmur of a crowd and reflects the high frequency sounds of the stage performers. But how did the audience manage to hear the lower frequencies of an actor’s voice? This is where the odd phenomenon of virtual pitch comes in: the human brain has the ability to reconstruct the missing frequencies. Virtual pitch helps us appreciate the incomplete sound coming from small loudspeakers (in a laptop or a telephone), when the low (bass) frequencies aren’t generated by a small speaker. Even though King Solomon ran a vast empire for 40 years there is little physical evidence of his reign over of the United Kingdom of Israel and Judah. A copper mine found in the Middle East could be the site of the mythical King Solomon's mines. Archeologists have excavated an ancient copper production center during a dig in southern Jordan and after carbon dating found that it matches the time when the legendary King Solomon is said to have run his empire. The discovery was made in the region the Bible refers to as Edom, now called Jordan. Earlier excavations at the site, during the 1970s and 1980s, led archaeologists to believe that the mines dated to the 7th century BC, but other archeologists dug deeper, discovering materials that prove the mine was active during King Solomon's reign. THE LEMBA TRIBE – JEWISH ORIGINS? The Lemba are a Bantu – speaking tribe indigenous to South Africa who behold a tradition that they were led out of the land of Judea and are therefore of Jewish origin. They also avoid eating pork, keep one day a week holy and practice circumcision. Although interesting, this evidence is hardly convincing since there are groups around the world who practice Judaic associated rites but have no proven Jewish ancestral connections. 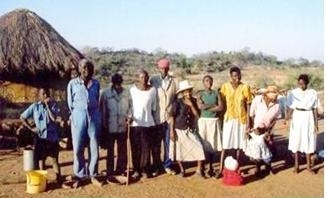 The Lemba, however, also have a strong genetic tie to the tribe of Judah. In 1999 scientists discovered that Lemba males carry a genetic marker called the Cohen Modal Haplotype on their Y chromosomes that is specific to Jewish priests who are descendants of Aaron (the brother of Moses). This genetic trait is less common among lay Jews (only 3-5% carry the marker) and is extremely rare among non-Jews. The genetic discovery provides credible evidence that the Lemba people are descendants of the tribe of Judah. Consider American Indian tribes where people built pyramids and even designed astronomical observatories. These weren't the Maya or Aztecs of Mexico. This culture arose in the Mississippi Valley, in what is now Illinois, about 700 AD and then disappeared long before Columbus reached America. 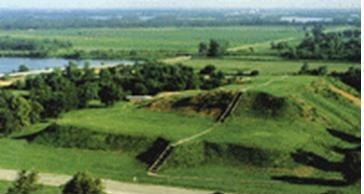 Cahokia was the largest city north of Mexico before Columbus arrived. Its size though impressive, was not its only distinguishing feature: the sprawling complex was adorned with over 100 earthen mounds. Many were constructed into huge, square-bottomed, flat-topped pyramids. At the vast plaza in the city's center rose the largest earthwork discovered in the Americas, the 100-foot Monks Mound which covers 14 acres. Archaeologists estimate that it was constructed between 900 and 1200 AD. Over the centuries many of Cahokia's original mounds were destroyed by modern farming, road building and housing developments. Many of the remaining 80 mounds may still hold many ancient secrets because archaeologists have managed to investigate fewer than two dozen. Beneath Mound 72 lie the remains of a tall man buried about the year 1050. He was laid to rest on about 20,000 shell ornaments and more than 800 apparently unused arrows with finely made heads. Also in the grave were a staff and 15 shaped stones of the kind used for games. The dogma was that the mounds were erected gradually at ceremonial gatherings over centuries. Cahokian pyramids contain various types of soil, some traceable to locations nearby. In 1998 while drilling to construct a water drainage system at Monk's Mound, workers hit stone - at least 32 feet of it. This discovery swept through the archeology community like wildfire. All of the Indian mound builders previously investigated used earth and wood for their building materials even when suitable stone was nearby. This burst of uncertainty surrounding the meaning of the stones beneath Monk's Mound is just the latest discovery shaking what was settled fact. Archeological finds are even challenging the conventional wisdom about when and how the Americas were settled. In 1961, Dr. Warren Wittry unearthed the remains of a circle of red cedar posts which were used as a solar calendar to track the seasons. The discovery was called "Woodhenge," in recognition to its similarity to the circular arrangement known as Stonehenge in Great Britain. After further excavations by Wittry and other archaeologists, more post pits were found; scientists now believe that there were as many as five Woodhenges at this location. These solar calendars had been built over a period of 200 years (900-1100 AD). The posts were 15-20 inches in diameter and stood about 20 feet high. Posts which were crucial as seasonal markers—those marking the first days of winter and summer solstices, and the spring and fall equinoxes have been identified. The most spectacular sunrise occurred at the equinoxes, when the sun rises due east. The post marking these sunrises aligns with the front of Monks Mound, where the leader resided. A pit near the winter solstice post suggests a fire was burned to warm the sun and encourage its northward return. Some ancient cultures had a penchant for constructing processional roads – i.e. throughways used for rituals rather than commerce or simply getting from one place to another. In South America, the famed Inca roads were preceded by thoroughfares 100 feet wide that seem to have no obvious practical purpose. The hundreds of miles of incongruously straight roads leading to Chaco Canyon in New Mexico seem to have been primarily for pilgrims making ritual treks to the great ceremonial complex in the canyon. On the east coast, Indians traveled the Mohawk Trail, the Virginia Warriors Trail, and other roads that existed to facilitate their travel through the wilderness. The Hopewell Culture may have built a long road designated not to facilitate everyday travel but apparently existed strictly for ritual processions. It is called the Great Hopewell Road and it is thought to connect the Hopewell centers at Newark and Chillicothe in Ohio. For 60 miles it traversed hills, valleys, and streams and was built without the benefit of bulldozers, surveying equipment or even a chain saw. Dr. Bradley T. Lepper, Curator of Archeology for the Ohio Historical Society, proposed the existence of the road in the 1990s after he discovered a forgotten manuscript at the American Antiquarian Society in Worcester, Massachusetts, detailing an 1862 survey of the road. He followed up this discovery by finding traces of the road which still exist today despite nearly two centuries of agriculture and other transformations of the Ohio landscape. His evidence, coupled with aerial surveys from the 1930s that found traces of the road extending rigidly straight for at least twelve miles towards the great Hopewellian center of what is now Chillicothe, 55 miles distant from present-day Newark, buttresses the concept of the existence of a Hopewellian version of via sacra. During the past thirty odd years scientists have stumbled upon the unexpected - and many times unexplained – sophistication of ancient cultures. In our topic series Planetary Sciences and Earth Mysteries Report #9 we discuss the astronomical observatory at Chaco Canyon and touched upon the subject of lunar standstills. A sophisticated fascination with astronomical events seems to be a common denominator for ancient societies across the globe. 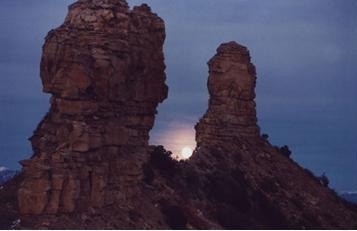 In this report we focus on how alignments to the moonrise or moonset on the days of lunar standstills can be found in ancient sites like Chimney Rock, CO. and the Hopewell Sites in Ohio. But first let’s briefly explain what a lunar standstill is. To do that first consider how the path of the sun changes throughout the year. This is shown below. The sun rises, of course, in the eastern horizon and sets in the west. But only during the fall and spring equinoxes does the sun rise exactly due east and set exactly due west. As the diagram shows, the sun rises (and sets) much further south on the day of the winter solstice and much farther to the north on the day of the summer solstice. Hence we can imagine that the rising and setting points of the sun (on the eastern and western horizons respectively) swing southward from the day of the summer solstice until the southern most limit is reached on the winter solstice and then swing north again to reach the northern most limit during the summer solstice. Based on keeping track of the sunrise and sunset directions, human beings discovered and created calendars by marking the extremes of the sunrise and sunset directions, or azimuths, along the horizon. The best known stone circle calendar in the world is Stonehenge. · Unlike the sun, the northern and southern moon setting extremes do not remain the same but change from month to month. · Therefore every 18.6 years the moon’s northern most setting point is at a maximum distance from its southern most setting point. These two points are called the maximum northern lunar standstill and the maximum southern lunar standstill. · Likewise every 18.6 years the moon’s northern most setting point is at a minimum distance from its southern most setting point. These two points are called the minimum northern lunar standstill and the minimum southern lunar standstill. Chances are you never noticed the 18.6 year cycle of the moon. But many ancient cultures were aware of it and it held great importance to them. The Octagon Earthworks were part of a geometric earthworks complex constructed by the Hopewell culture sometime around 0-500 AD. Most of those earthworks have been obliterated by development, but the Octagon Earthworks have been preserved on the site of Moundbuilders Country Club in Newark, Ohio. In 1981 two scientists studying The Octagon Earthworks made a startling discovery: the major rising and setting points of the moon, encompassing the 18.6 year cycle, are incorporated into the architecture of the Octagon Earthworks. The main axis of the complex points to an azimuth of 51.8º, measured from true north. This orientation is most interesting because at the latitude where the complex is located (40º 3’ 4” N), the most northerly rising of the moon will occur directly along the axis. This means that every 18.6 years an individual standing on the main axis of the complex will view the moon directly above the axis. On certain days for a period of about two years during this cycle the moon can be observed to rise directly along the Octagon axis. An even more dramatic demonstration of how ancient people incorporated the 18.6 year cyclical lunar standstills points into their architecture comes from the Chaco Canyon complex. Among the most remote and mysterious of the Anasazi outposts was Chimney Rock, in what is now the very southwest corner of Colorado, 90 miles from Chaco Canyon in New Mexico. Why did the Anasazis build an enormous ceremonial Great House at Chimney Rock so far from the epicenter of their culture? And why was it built behind two immense sandstone spires? In 1986 archaeologists solved the riddle: the Chaco people built the Great House as a lunar observatory, precisely aligned to observe moonrise during the maximum lunar standstill. The edifice is located behind and between two spires, from its location one can observe the moon rise between the two spires during the maximum lunar standstill occurring every 18.6 years. How in the world were the Anasazis – who had no written language – able to determine this location to be an alignment axis? And why was it so important to them that they would journey 90 miles from their home grounds to build a ceremonial building that required six million stones, over 20,000 tons of earth and clay and 5,000 logs? Laborers had to haul wood, food and water from the valley floor, two miles away and 1,000 feet down. Rather then positioning the edifice at the center of the mesa, where one might expect, they built it right to its northern edge, creating the broadest possible shelter from which to view the moon rising between the rocks – roughly every 18 years. To learn more about the astounding astronomical abilities of the Anasazi see Report # 9 in the topic series Planetary Sciences and Earth Mysteries. Report # 12 discusses scientific discoveries which evince the sophisticated astronomical knowledge common to many “primitive” cultures. Specifically, we described edifices erected by American Indians to track major lunar standstill events. Similar cyclical moon standstills have been observed at the megalithic sites at Stonehenge and at Callanish in Scotland, the two other sites in the world where scientists have found credible evidence that preliterate peoples used immense stone pillars to construct alignments where – every 18.6 years - the moon stands still. Other prehistoric structures such as pyramids, temples and burial chambers have been shown to incorporate solar alignment events into their architecture. · During the restoration of the famous Irish burial chamber, Newgrange (constructed 3,300 to 2,900 BC) in the early 1960s it was discovered that the builders of Newgrange deliberately oriented the passage so that for a few days at the winter solstice the rays of the rising sun would shine through a special aperture to illuminate the chamber. This discovery was made by Dr. Michael O’Kelly a Professor of Archeology at University College Cork. Newgrange entrance showing the light box above the door. The pyramids of the third millennium BC in Egypt were built as tombs for the kings of that period. In 1883 when modern surveying techniques were employed investigators were astonished to discover how precisely oriented the pyramids were with the cardinal points of the compass. It wasn’t until 2000 that scientists discerned just how the ancient Egyptians achieved such extraordinary accuracy. · Uxmal is a Mayan city in the Puuc Hills of Yucatan, Mexico. The Governor's Palace at Uxmal is aligned towards a southerly rising of Venus which occurs once every eight years. At first this was dismissed as just coincidence. When it was later discovered that interior portions are covered in glyphs which stand for Venus and Mayan zodiacal constellations, archeologists realized that the alignment was no coincidence. In sub-Saharan Africa two circles of standing stones have been shown to have astronomical significance. One, called Nabta, is the oldest astronomical site in the world predating Stonehenge; it was constructed some 6,500 years ago by a Neolithic people who were most likely the predecessor of the Egyptians. (By contrast, Stonehenge was built around 4,500 years ago.) The site was excavated in the late 1990s. It consists of several megaliths spread out over approximately one square mile. At one location massive stones, some more then 9 feet tall, were set in a circle to predict the coming solstices. Laborers had to drag these monstrous stones for more than a mile and then position them at precise spots on a circular circumference. The 12-foot diameter stone circle featured four sets of upright slabs. Two sets were aligned in a north-south direction while the second pair of slabs provided a line of sight toward the summer solstice horizon. During the first three weeks before and after a solstice, the standing stones would cast no shadow in the noonday sun, due to their proximity to the equator. An east-west alignment also is present between one megalithic structure and two stone megaliths about a mile distant. There have been several other alignments found, but their significance, if any, has not been deciphered. Another, much more impressive, stone alignment was discovered in northwestern Kenya in a region called Namoratunga. Here 19 large basalt pillars are arranged in rows. Since the site is dated at approximately 300 BC, archeologists have taken sightings on seven prominent stars as they would have appeared during this time. The stars chosen are those used by Eastern Cushites, the present inhabitants of the region, in calculating their rather sophisticated calendar – the Borana calendar. The Borana calendar is not grounded in solar events (and therefore cannot demarcate the seasons) but instead relies upon a matrix of observations that correlate the rise of the new moon on the horizon (i.e. in conjunction with a particular pillar) together with a particular star that also rises on the horizon in the same position (i.e. in conjunction with the same pillar). Pairs and frequently triads of these pillars line up accurately with seven key stars. For example the new year commenced when a star called Beta Triangulum rose above a certain pillar – when the new moon rose above that same pillar it signified the start of the new year. With this system the ancient inhabitants of Kenya constructed the Borana calendar, consisting of 12 months - each month being the period between two successive new moons. Some of the remaining stone pillars of Namoratunga. How these ancient people obtained the advanced knowledge to determine the correct placing of the massive stone pillars to provide the observational alignments that served as the foundation for their complicated calendar is a mystery. The Borana calendar preceded by about 1,800 years the development of our present day Western Gregorian calendar system. The Mayan calendar system, with its complicated system of synchronized and interlocking cycles predates the Borana calendar by approximately 300 years. In Report #7 we described the advanced acoustics of an outdoor Greek theater built in 400 A.D. We have since discovered other investigations that provide glimpses into some of the sophisticated architecture and acoustics of ancient, megalithic structures. At open air sites with paintings, Waller found that echoes reverberate on average at a level 8 decibels above the level of the background. At sites without art the average was 3 decibels. In deep caves such as Lascaux and Font-de-Gaume in France, echoes in painted chambers produce sound levels of between 23 and 31 decibels. Deep cave walls painted with cats produce sounds from about 1 to 7 decibels. In contrast, surfaces without paint are 'totally flat'. The article describes the investigations of one individual who had visited rock art sites in Europe, North America, and Australia. Standing well back from the painted walls, he would clap his hands or create percussion sounds, and then record the echoes bouncing back. To his surprise and bewilderment, he found that the rock art seemed to be placed intentionally where the echoes were not only unusually loud but were related to the content of the pictures. Where hoofed animals are depicted, one may evoke echoes of a running herd. If a person is drawn, the echoes of voices sometimes seemed to emanate right out of the picture. The mystery continues through the investigations of two physicists from the University of Reading, U.K. Scattered across Britain are roughly 70 megalithic stone circles. A lot of them are concentrated in northeastern Scotland. One of the most famous is Easter Aquorthies near Aberdeen. When I first visited the circle, what struck me was, as I moved across the centre region of the monument, I heard an increase in volume – it became a fuller sound. Moving across the site, I heard these sounds suddenly decrease. 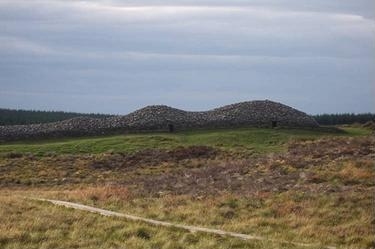 But it is the Neolithic burial mounds built around 3500 BC that have the strangest properties. Typically they consist of a long chamber which is reached by crawling through a small and cramped tunnel. Scientists studied the grave passageways at Camster Round and Newgrange. 'I was amazed by these caverns,' said University of Reading physicist Dr. David Keating. The caverns vary in size but their resonant frequencies are very similar. They would amplify a fast drumbeat producing enhanced sounds and echoes during rituals, he added. Dr. Keating suggests that the caverns are designed to generate an advanced acoustic phenomenon called Helmholtz resonance. Calculations suggest that drumming at two beats a second would have caused resonance. Inside the dark chamber with its dank air and interred bodies the sound effects would have produced an unforgettable, eerie experience for Neolithic man. The resonant properties of a number of tombs have now been modeled, including well known examples such as Newgrange in Ireland and Maes Howe in Orkney. The results suggest that these places may have resonated at frequencies which are too low to be heard by human beings. It is possible, however, that this resonance may have been perceived as a feeling rather than a noise, similar to the sensation of standing near large bass speakers. Ancient Greek and Roman historians recorded that during the siege of Syracuse in 212 BC, Archimedes saved his town by using mirrors to direct sunlight onto the wooden Roman warships setting them afire. Archimedes’ feat was repeated in 1973 by a Greek engineer using 70 (5 feet by 3 feet) mirrors held by volunteers who focused the sun’s image on a wooden boat about 160 feet from shore. Within seconds the boat started to burn and was quickly engulfed in flames. In 2005 students at M.I.T. successfully reproduced the event using 100 (1 foot by 1 foot) mirrors. 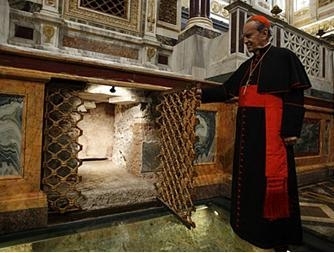 Timeline: December 11, 2006 St. Paul's stone coffin has been found beneath Rome's Basilica of St. Paul's Outside-the-Walls (named for its location beyond the ancient wall surrounding Rome's center). Its contents however remain a mystery, Vatican archaeologists announced today. The sarcophagus was buried beneath the main altar, under a marble tombstone bearing the Latin words "Paulo Apostolo Mart.," meaning "Apostle Paul, Martyr”. St. Paul was born Saul in the first decade of the first century AD. in Tarsus, the capital of the ancient Roman region of what is now Turkey. Though he never met Jesus Christ, he joined the first Christians after a dramatic conversion on the road to Damascus. In 65 A.D. he was imprisoned in Rome, beheaded, and then buried in the family tomb of a devout Roman noblewoman, Matrona Lucilla. Around 320 A.D. Emperor Constantine built a small basilica to receive the pilgrims visiting Saint Paul's tomb. 70 years later, in 390 A.D., Emperor Theodosius enlarged the building and encased Paul's remains in a sarcophagus. In 433 A.D., part of the building collapsed during an earthquake. In the course of renovations the floor was elevated. The sarcophagus was buried and covered by a marble tombstone. In 1823 a fire completely destroyed the ancient basilica, and the modern Saint Paul's Outside-the-Walls was built on the site. The sarcophagus and the tomb were buried under layers of debris and concrete. In 2001 Vatican archeologists started to excavate the buried sarcophagus finally completing the task in December 2006. The sarcophagus was left sealed. This seems to confirm the unanimous and uncontested tradition that they are the mortal remains of the Apostle Paul. The Vatican announcement came just days after another news story that the touched off global interest claiming that a fresco representing the oldest known icon, dating back to the late 4th Century, of the apostle was discovered and restored using sophisticated laser technology. The discovery was made at the Catacomb of Saint Thekla, who was a follower of St Paul and who was put to death under the Emperor Diocletian at the beginning of the 4th Century. Early Christians in Rome typically buried their dead in catacombs dug into the soft rock under the city and decorated the underground walls with devotional images. A laser is used to restore the image of St. Paul. Popular belief holds that bone fragments from St. Paul’s head are in another Rome basilica, St. John Lateran, with his other remains inside the sarcophagus. None of the news accounts mentioned whether pieces of cranium were found in the sarcophagus. HTLV-1 is a type of retrovirus discovered at the National Cancer Institute by Robert Gallo and his colleagues. Although similar to the retrovirus that causes AIDS, HTLV-1 instead causes leukemia in about 3% of those carrying it. In southern Japan, roughly 4% of the population carries some genetic material (called a pro-virus) of HTLV in their genes. Isolated groups living today in Columbia and Chile also carry some of the virus DNA. Does this correlation prove that South America was populated with settlers from Japan in the distant past? Such a biological linkage would augment pottery evidence from Peru and, especially, Ecuador where Jomon-style pottery 4,000-5,000 years old has been found on the coast. However, the HTLV-1 virus could have been introduced to South America by more recent visitors. Is there any way to fix the timing of HTLV-1's introduction to South America? 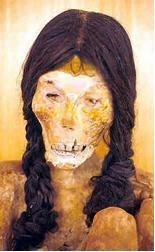 In 1999 archeologists discovered over 100 mummies left in the Atacama Desert 1,200 – 1,500 years ago. Using a very sophisticated technique of molecular biology called the Polymerase Chain Reaction; they could detect HTLV pro-virus in the mummies’ bone marrow. The Atacama mummies have therefore left a genetic signature of a time in the distant past when Japanese explorers settled in parts of South America. The classical picture of ancient China as a closed, homogeneous culture was shattered in the 1980s after the unearthing of mummified Caucasians up to 4,000 years old in China's northwestern province of Xinjiang. These dried mummies have long noses, deep-set eyes, and long skulls that are typical of Caucasians. Some even have blonde hair and at least one was a red-head. Over 100 well preserved mummies were excavated at Qizilchoqa, one of four sites discovered so far. Obviously they are the remnants of permanent settlements and not merely a few lost Europeans. Dr. Victor Mair, a professor of Chinese at the University of Pennsylvania, spearheaded the research on these mummies for the U.S. He advocates the existence of a substantial two-way, east-west flow of ideas and inventions beginning at least 3,000-4,000 years ago. Genetic analysis of DNA isolated from the mummies reveals the presence of Caucasoid genetic markers. In Report #4 we describe how Neanderthals synthesized a form of high-tech glue that they used to construct their tools with. This report discusses an advanced application of material science that may have been used in the construction of Damascus swords – superior weapons that the Muslims used against the Crusaders. Nanotechnology involves the manipulation of molecules in order to make materials with unusual properties. The most common – and extraordinary example - are carbon nanotubes which have the shape of a cylinder and can be one atom in thickness. Carbon nanotubes are the strongest and stiffest materials yet discovered in terms of tensile strength and elastic modulus respectively. Along their long axis they are excellent heat conductors but along their short axis they are strong insulators. Multiple concentric nanotubes precisely nested within one another, form an atomically perfect linear or rotational bearing. This is one of the first true examples of molecular nanotechnology, the precise positioning of atoms to create useful machines. In 2003 physicists utilized this property to create the world's smallest rotational motor. Future applications such as a gigahertz mechanical oscillator are foreseen. Nanotubes can conduct electricity almost 1,000 times better than copper. They can also function as semiconductors. The steel of Damascus blades, which date back to 900 AD, were first encountered by the Crusaders when fighting against Muslims. They had unusual features not found in European steels including a characteristic wavy banding pattern known as damask, extraordinary mechanical properties, and an exceptionally sharp cutting edge. The swords were cast from a type of steel called wootz. Scientists in Germany have used high-resolution transmission electron microscopy to examine a sample of Damascus sabre steel from the seventeenth century and, to their surprise, found that it contains carbon nanotubes as well as cementite nanowires. This microstructure may offer insight into the beautiful banding pattern and superior qualities of the ultrahigh-carbon steel created from an ancient recipe that was lost long ago. The Antikythera Mechanism, with its intricate arrangement of bronze gears, has befuddled and, at the same time, totally mystified scientists ever since its accidental discovery in a sunken Roman ship by sponge divers off the tiny island of Antikythera more than a hundred years ago. It was used by ancient Greeks to predict astronomical cycles including the eclipses of the sun and the moon as well as the position of the planets. The device is considered to be the greatest example of ancient science and technology. It is thought to have been built about 150–100 BC. Technological artifacts of similar complexity did not reappear until a thousand years later. The sophisticated knowledge and sometimes technical achievements of ancient people continues to surprise and confound us modern day dwellers. In past reports we have documented some of the extraordinary abilities that ancient cultures possessed. A recent report from MIT explains that the Mayans were most likely the first polymer chemists. MIT scientists provide solid evidence that not only did these pre-Columbian peoples know how to process the sap of the local rubber trees along with juice from a common vine to make rubber, but they had perfected a system of chemical processing that could alter the properties of the rubber depending on its intended purpose. Some of the rubber was used to synthesize rubber balls (probably used for ceremonial purposes), some as large as beach balls. Degraded rubber balls have been unearthed from archaeological sites scattered across Central America. Written descriptions from the Conquistadors and the Mayans describe rubber sandals worn by the tribesman. This type of rubber has mechanical properties entirely different from the elastic spheres. Other types of processed rubber that was used to make rubber bands and adhesives used for ornamental wear and for attaching blades to shafts, was optimized for resilience and strength. The MIT scientists discovered that varying the proportions of latex from rubber trees and juice from Morning Glory vines allows the synthesis of rubber that has different physical properties. They believe that over time the Mayans perfected this system so that they could produce different forms of rubber centuries before Goodyear developed his vulcanization process. This Mayan drawing depicts The Aztec god, Xiuhtecuhtli, offering rubber balls during a ceremony.